Widespread flooding in the southern Brazilian state of Santa Catarina has left at least 45 dead, with more than 22,000 forced from their homes. 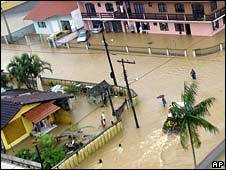 Heavy rainfall over the last two months has led to landslides which have destroyed homes and blocked roads. Emergency workers have been using helicopters and boats to try to reach those left stranded. A state of emergency has been declared and President Luiz Inacio Lula da Silva has offered federal help. By Monday, more than 22,000 people had been forced out of their homes. Some have been able to stay with relatives and friends, while others have gone to public shelters. Civil defence officials said at least 45 people were known to have died. He added that at least 14 more people were missing and so the "death toll, sadly, is going to pass 50". Newspaper photographs showed streets submerged by waist-high water levels, and four towns were reported to have been cut off by the floods. Joao Paulo Kleinubing, the mayor of Blumenau, where at least 10 people have died, said the major challenge would be supplying shelters with medicines and food. 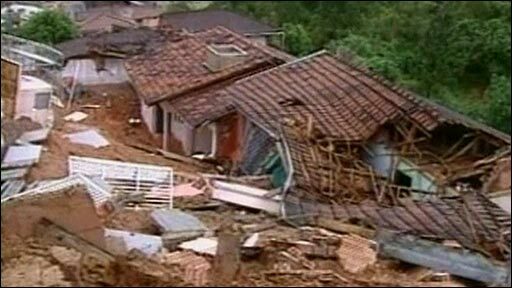 Many of the deaths have been caused by the landslides, the BBC's Gary Duffy in Sao Paulo says. Heavy rain and flooding in Brazil have been known to lead to high death tolls in the past partly because homes are often constructed in dangerous locations that are vulnerable to landslides, he adds. State governments have been criticised for not doing enough to stop people building in areas of high risk.